Heavenly blog! : No. 1329: Laial Ayoub, do not dare take the challenge of answering me on Hijab blog! No. 1329: Laial Ayoub, do not dare take the challenge of answering me on Hijab blog! 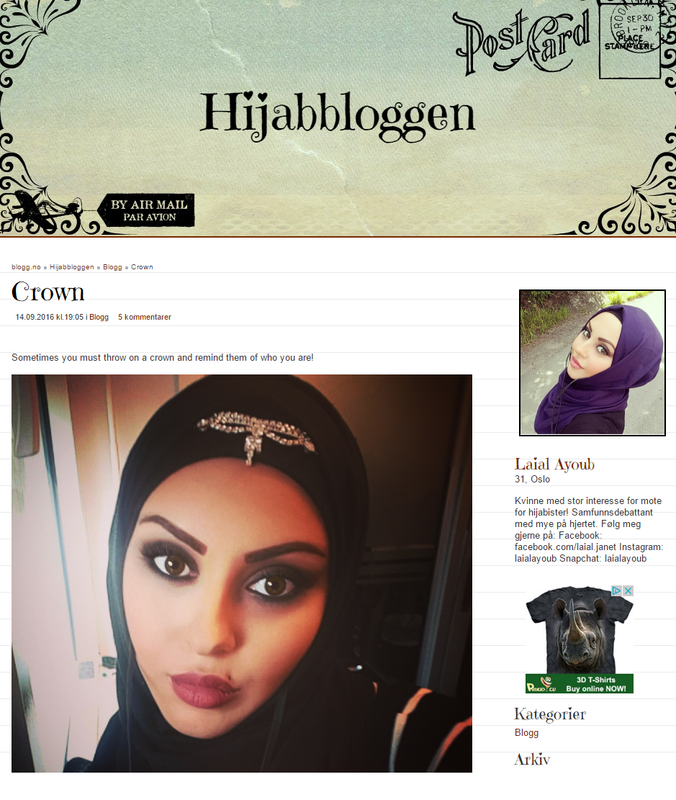 Laial Ayoub, do not dare take the challenge of answering me on Hijab blog! I have debated with one of the supporters of hijab-clad Malika Bayan who did not get cut off at the hairdresser Merete Hodne Bryne Jæren. Image of Laial Ayoub who has the political and cultural headdress hijab wearing. But are painted and decorated as at least far without passing the teachings of Islam. Here breaks than most of the Koran Vessels, but want others to acquiesce under both the one and the other. Congratulations Bayan, Hodne was convicted. Then I will take this opportunity to congratulate my friend Malika! Hodne anchor judgment, but do not think she's going far with it. Racism and extremism is something we do not want us in this country, no matter who it comes from! That which I have replied to and written about many times. Make it short, hijab is religiously. It says in the Koran that women should cover themselves and in the Sunnah describes how to do it. Ditto. Here is some of what I have written to Laial Ayoub and her hijab blog. That tells clearly that the judgment against Merete Hodne is fabricated and does not sting. When the hijab is not a Muslim headdress, but is politically and culturally headgear. It is foul that Hodne would not cut a person, even if one went with the political symbol that hijab is. But Jesus said turn the other cheek and move on. Here makes a not but confronted competent in the strongest possible way. Do you gave a very disorderly responses. WHERE IN THE KORAN SAYS THAT WOMAN SHOULD HAVE hijab? NOT A PLACE, THEREFORE hijab A NON rElIgIoUs SOMBOL? But a political and insulting pester for certain! AGREE? Or you can argue for something else? I will not find out what you mean by reading post after post that you have written. I want an answer now. To shorten everything. I have read in the Koran, but not found a single verse that says that hijab is obligatory in Islam. Hijab is a political symbol that indicates support for the Islamism as the Ottoman Caliphate was built. And it became popular to use after the Iranian revolution in 1979. Admittedly, women had various forms of headgear and veil for centuries. Many of those who began to wear the hijab in 1980, had previously been exposed or used headscarf that showed parts of the hair and neck. I repeat it, find the verse in the Koran that says that it is mandatory! You have not answered, how the Koran says that women should have the hijab? It says that one should not Jaala like you and many do, you follow in other words not the Koran. You follow only rebellious Iranian leaders, it was they who coined the burqa decree. Quran does not teach this! Fact is well that no court had convicted one that was rejected -who came in with nazisynboler or image and thumbs up for Abb! Guaranteed! And the court refuses to admit that hijab etc .. just to front Islamic violent ideology! They are cowardly, -and yet another blow below the belt for the Norwegian people. And that they now have "determined" that this is RELIGIOUS garments contrary to multitudes of Muslims who say that it is NOT religiously, -at DE not use it and still Muslims -are A SHAME !! It is only in the Koran that they should dress modestly, -and they can perfectly well do with normal Western clothes! And once again -hijab like IS an ideological garment -DO religiously -this should find many Muslim witnesses -and make restitution and truth will come out!